When Mithali Raj led her team out for the third one-day international against New Zealand on Friday, 1 February, she added another record to an already glittering career, becoming the first woman to play 200 ODIs. India Women have played 263 ODIs in their history. Raj has now featured in 200 of them. Since her ODI debut on 25 June, 1999, the team have played 213 matches in the format. She has been a part of all but 13 of them. Her international career has lasted 19 years and 219 days – and counting! That is the highest among all female players, and fourth-highest if you count the men too, behind only Sachin Tendulkar, Sanath Jayasuriya and Javed Miandad. This long career has brought her 6613 runs, which include seven hundreds and an incredible 52 fifties, the most recent of which she scored in the second ODI against New Zealand. Many of Raj's best knocks came at a time when the women's game hadn't reached the levels of professionalism that it now has, and before many of the games were on television – but as the sport has grown, so has her own game. Raj made her debut at 16 years 205 days, on India's tour of Ireland and England, her precocious talent having caught the eye of selectors a few years before. Opening the innings, she became the youngest female player to make a century. She and Reshma Gandhi, another debutant, added an unbroken 258 for the opening wicket, which was a national record for a long time. It remains the third-highest first-wicket partnership of all time. Those who watched her remember her confident shot-making and maturity, showing that she was one for the long run. Interestingly, Raj didn't realise then that the game would count as her debut. The team too thought they were playing an unofficial game, and it was only later that they found out otherwise! Raj's international debut was followed by scores of 4 and 0. 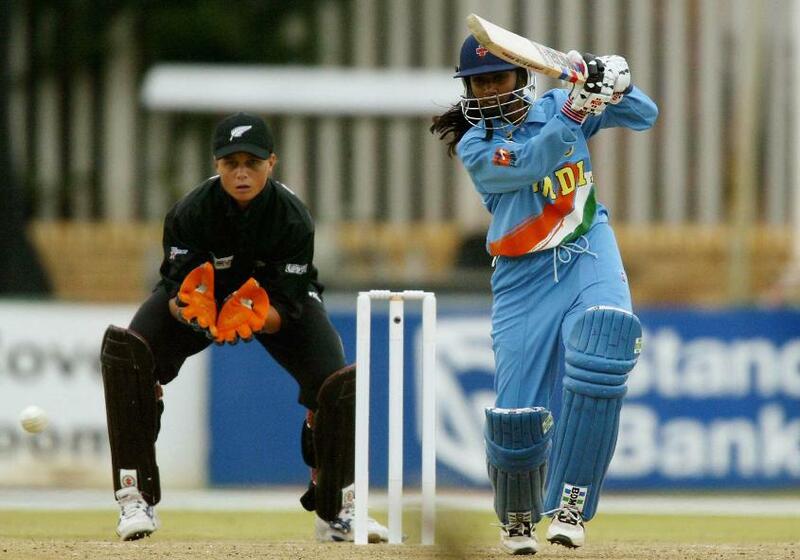 Her domestic form, however, remained strong, and the teenager was considered key to India's success at the 2000 World Cup in New Zealand. And so it proved to be. She made quite a statement in India's opening game, against a well regarded South Africa side, with her half-century backing up the efforts of the spinners. In a chase of 129, she made more than half the team's runs, bringing up 69* in 95 balls. It included 11 fours. She went on to play two more important knocks in the next two games, before she was struck down by illness that forced her out of the tournament. India struggled for balance without her and lost in the semi-final. This, by her own assessment is her favourite knock, because it came when the team needed it the most and took India to their first World Cup final. It also needed her to overcome a bad knee injury to drag her team to a challenging total against a strong New Zealand side. Asked to bat under gloomy skies, and facing some of the fastest bowlers at the time, India were 38/2 in the 14th over when Raj, a young captain hungry to prove herself, got together with Anjum Chopra. The duo began slowly, soaking up the pressure of a modest run-rate, putting the onus on not taking too many risks in their stand of 66 off 18.4 overs. Raj then found support in the middle order and teed off. Her last 40 runs came at almost a run-a-ball, as India posted 204/6. By then her knee was swollen, and she had to sit out the fielding innings as her team completed a historic 40-run win. The ICC Women's World Cup 2013 hadn't gone well for India. Playing at home, they crashed out in the group stages. This was the seventh-place play-off match against rivals Pakistan. There was only pride to play for – but a lot of it. There was harsh criticism around the team and Raj's captaincy, and she chose this moment to answer all of it, while also reminding her team of a few important lessons. "We had to literally pull ourselves up this morning for the game but as professional cricketers we know that these things happen," she said after the game. On a ground where no team in the competition had chased more than 105, her hundred dominated the chase of a tricky 193, sealing a six-wicket win. No other Indian player made more than 26. She even hit a six along the way. Another big knock against old foes New Zealand in another massive World Cup game. During the defeat to Australia in their previous match, she had crossed Charlotte Edwards' mark to be the highest run-scorer in women's ODIs, but it wasn't a happy moment for her. Against New Zealand, a semi-final spot was at stake, and she raised her game in the virtual quarter-final. She made 109 of her team's 265/7, finding good partners in Harmanpreet Kaur and Veda Krishnamurthy. The knock came off 123 deliveries and included 11 fours, but also notable was how she kept the scorecard ticking with good running. It transferred the pressure onto New Zealand, and a stellar bowling performance had them bowled out for 79 for a comprehensive 186-run win to seal their spot in the ICC Women's World Cup 2017 semi-final.